Amazon Web Services&apos; S3 offers cloud-based storage that can be integrated with your system. 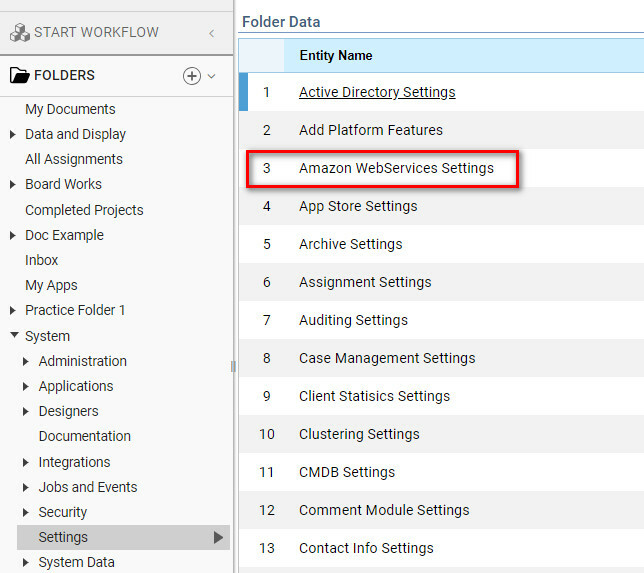 Files that are stored on Amazon S3 can be monitored and listed with one Put File in S3 Step. To list the files in your Amazon S3 account, first set up your Amazon Web services Settings in the portal by installing AWS. Install AWS:	Navigate to System>Administration>Features. On the right side of the Designer Studio locates Amazon Web services (AWS) and select Install. Scroll down under Available Features	locate and select AWS and chooseInstall	. After Amazon Webservices is installed, Navigate from the Designer Folders to System>Settings> Decisions AWS. Right-click and select Edit	to add Access Key and Key ID. Choose your Default Region	and enter theAccess Key ID	and Secret Access Key	and select Save. Start by creating a new Flow, selectCreate Flow	in the blueaction panel across the bottom of theDesigner Studio. 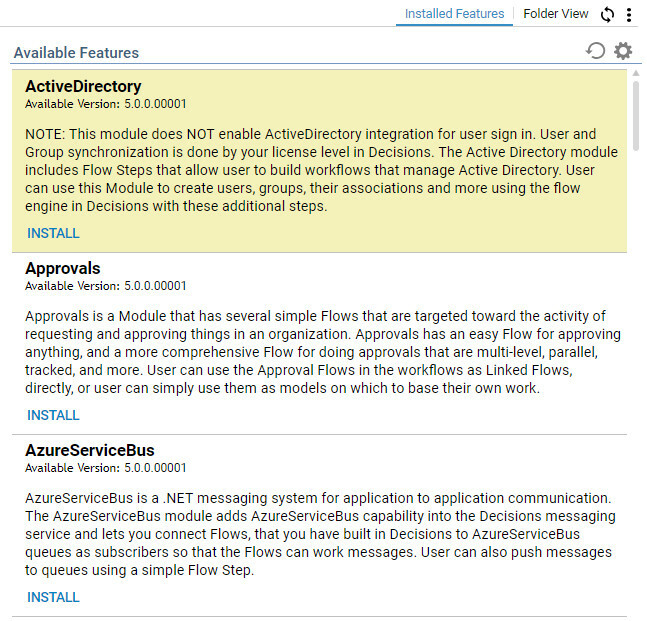 In the Steps Tab	locate Integration, Amazon AWS> S3,	choose Put file In S3	,	drag and drop step into Flow Designer. Settings	In the Properties Tab	under Common Properties	and under Inputs>Bucket Name	set toConstant	and add your Amazon S3 File, Bucket Name. Under Inputs> File	set toConstant	and upload or drag and drop File. Under Inputs >	local File To Store	choose Constant	and name the File. UnderInputs>	Region	set toConstant	and define its Value. 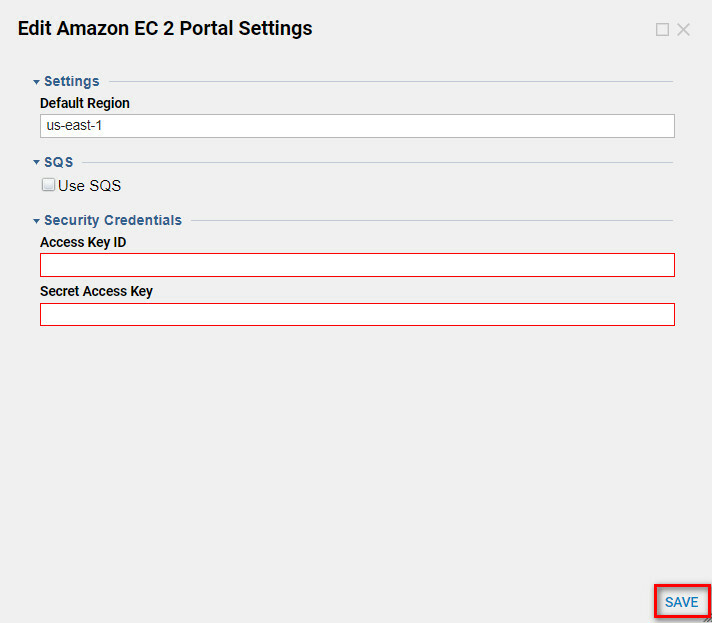 This Region	must match the Region	that was set previously in theDefault Region	when Editing Amazon Webservices	. Set the Region	the appropriate Region code, in this examplewe used us-east-1. Last, under Outputs and Output choose Rename and set the value to PutFileInS3_Output. Now that the flow is complete, we need to run the flow. Selecting Debug	in the Flow Designer , or close the Flow Designer and right click on the Flow and select Run Flow.